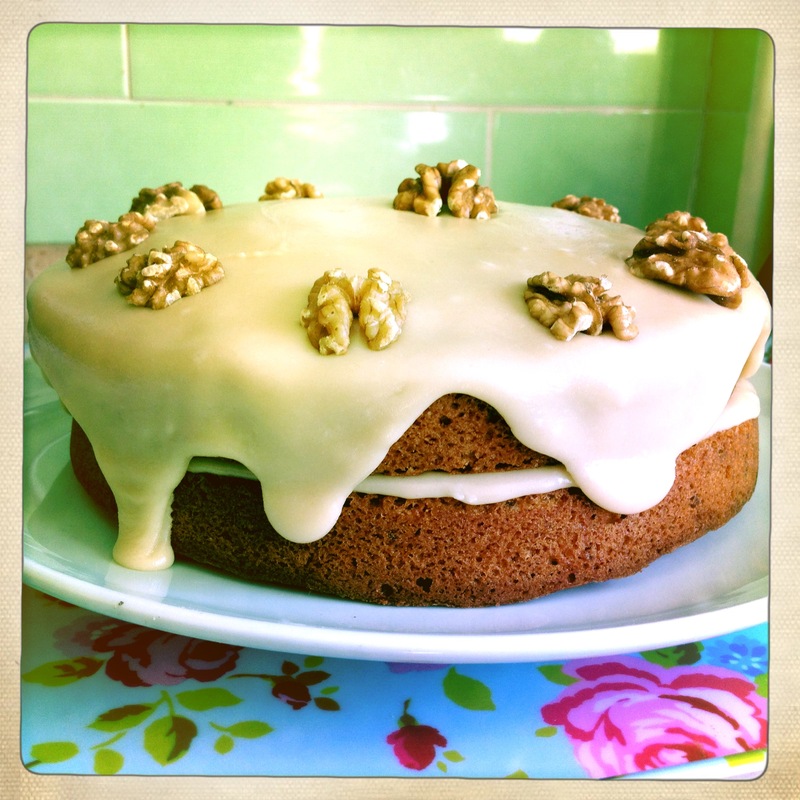 This is my take on the traditional Coffee Cake, a popular cake for afternoon tea. I made this cake with my Sister Sharon Maher in mind as her favourite cake is Coffee Cake. Grease and line two 8″ cake tins with baking paper. Pre-heat oven to 170 degrees fan oven. Mix together the butter and sugar, the eggs, the flour, baking powder, milk, maple syrup and chopped walnuts. Put the cake mixture equally in to the prepared cake tins, smoothing slightly on top and bake for between 25 and 35 minutes in a pre-heated oven. Allow to cool for 5 minutes before transferring to wire tray. While the cakes are cooling, prepare coffee and maple fudge frosting. Add the butter, sugar, maple syrup and coffee to pan and bring to heat until all dissolved together. Allow to cool slightly and then add the icing sugar and whisk until thick, smooth and glossy. Put one of the cakes on cake stand and layer on frosting. Place additional cake on top and layer on the rest of the frosting on top, allowing to drizzle down the sides. Decorate with walnuts.